Spirit Airlines continues to make adjustments in the face of lingering pricing softness in the US domestic market and selected international regions. In addition to pricing pressure on baseline fares, Spirit is also starting to experience trickle-down effects on its non-ticket revenue, from lower average fares in its markets. 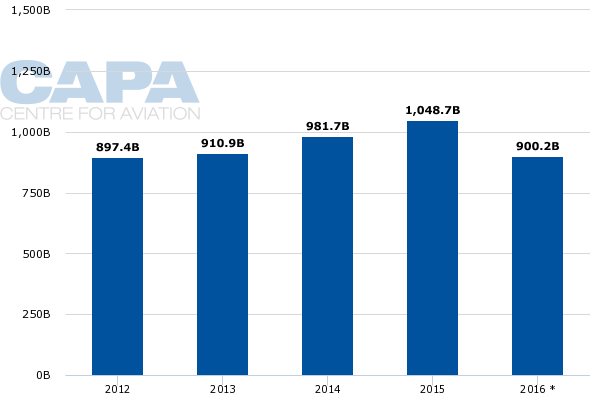 The airline's position is that pricing levels are in line with softness that became more pronounced in Oct-2015, and it is predicting that its 2Q2016 total unit revenue should fall in line with the 13.8% drop recorded in 1Q2016. However, for a couple of quarters Spirit’s performance in that metric, although still negative, has been better than the company’s initial predictions. Assessing the overall pricing environment in the US market, Spirit believes that the pressure is not entirely attributed to ULCCs. Legacy airlines are initiating deeper discounts on connecting fares in particular, and there is also what Spirit deems as excess capacity in some of the larger legacy US hubs. Spirit’s total unit revenue dropped 13.8% in 1Q2016, which was an improvement over the 16.8% decrease in 4Q2015. Company executives had guided to a similar quarter-on-quarter performance, but recently explained the performance in Mar-2016 was better than expected. The company has estimated that approximately a third of the unit revenue pressure that it is experiencing is attributable to its own growth, which measured in ASMs was 26.5% in 1Q2016, and the remainder stems from the overall general competitive environment. Spirit also highlighted some localised issues in South America, particularly Colombia. The company’s rival jetBlue has also experienced pressure in Colombia, and plans to reduce capacity to the country by approximately 25% in the US summer season. The Spirit CEO, Robert Fornaro, has said that much noise remains in the US pricing environment beyond the fares offered by ULCCs. He stated that price competition had broadened during the last year, beyond the Dallas market to Chicago and the US west coast. Some of that price competition is occurring between the larger US global network airlines, said Mr Fornaro. He was asked to give his overall assessment of the pricing environment, and stated that although Spirit does not cater to the corporate market, “everything we hear is that there is weakness there”. That softness creates a buy-down mentality, said Mr Fornaro. If customers willing to pay USD500 disappear, then fares drop. He remarked that for the typical legacy airline, “its traffic is drying up where they have a connection versus non-stop”. There are a couple of ways to handle that, Spirit’s CEO explained: one is to cut prices, and the other is to place smaller aircraft on hub-to-hub flights. American and other legacy airlines have recently reinstituted “AAdvantage” fares and similar fare products, which entail offering a lower price on a connecting itinerary versus a nonstop trip. American cited the previous absence of those types of fares as one element driving weaker close-in demand. “I think, arguably, you are seeing excess capacity at some level in the very large mega hubs,” Mr Fornaro has said. 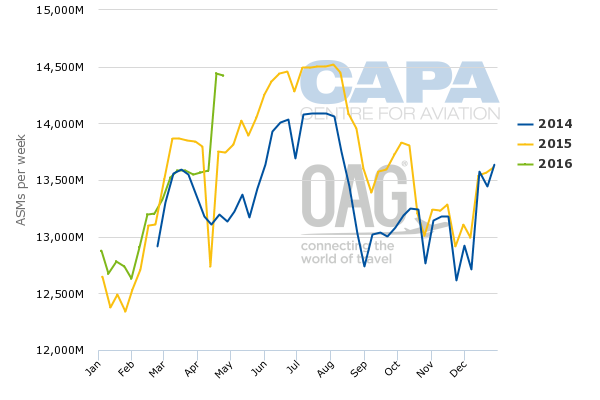 For late Apr-2016, data from CAPA and OAG show that overall US domestic ASKs have increased sharply. As fuel costs remained historically lower in 2015, US domestic ASKs jumped 6.8% year-on-year for calendar year 2015. Spirit’s visibility into the US pricing environment has improved due to a new pricing system adopted by the airline. Mr Fornaro explained that Spirit has a better sense of how its competitors are selling in its markets, comparing the situation now versus a few months ago. “In theory it allows us to be more tactical,” he concluded. A cornerstone of Spirit’s strategy has always been its ability to generate high levels of non-ticket revenue, but during the last three quarters its non-ticket revenue per flight segment has contracted. Nevertheless, its non-ticket revenue per flight segment was still a healthy USD53.23. Spirit has experienced modest pressure on takeup rates for certain ancillary items such as bag and change fees, which it concludes to be correlated with low fares in its markets. The airline’s average ticket price fell 20.5% year-on-year in 1Q2016, to USD54.65. Mr Fornaro observed that Spirit has been “in a lockdown” working to launch a new website design later in 2016, which has resulted in the company slowing or stopping other initiatives. There are some new elements that Spirit plans to introduce in its ancillary business to drive USD1 to USD2 in additional revenue per segment. He did not want to offer specifics, but did highlight dynamic pricing of ancillaries. The effects of new legacy basic economy fares on Spirit are tough to predict - and not "localised"
American and United plan to join Delta in introducing segmented fares to compete better with ULCCs. Some of Spirit’s investors appear to be attempting to determine the effects that pricing segmentation will have on the airlines. Previously Mr Fornaro has stated that the efforts to move to a basic economy product should result in less price competition, as a result of larger airlines limiting the discounting to a certain percentage of the market. The effect of the introduction of a basic economy fare by the three large US global network airlines depends on the number of seats allocated to that fare class, said Mr Fornaro. “If they keep the same number of seats out there, then it is neutral.” If those seats come to be reduced or better managed the outcome would be positive to Spirit, he added. Falling oil prices have affected ULCC Spirit in ways that some investors didn’t expect – unit revenue pressure, and now pressure in the all-important area of non-ticket revenue. The airline is working to adapt to its new reality, which is a soft pricing environment driven by low fares and excess capacity in some markets. Although those pressures will likely correct themselves when oil prices rise, for now Spirit’s total unit revenue remains challenged, and investors may be questioning whether the ULCC model is as bullet-proof as it once was.